I could not agree more with the above quote by Steve Jobs. Time has shown that the most successful people in history have had the drive and determination to succeed. These attributes are necessarily elements and would help anyone achieve their most desired goals. Successful people never lose their desire and their passion despite the various obstacles they face. We should consider ourselves fortunate as these people have paved the way for us, and we would thus be wise to capitalize on their legacy. We are living in a time inundated with information. It’s the time when technological science is growing. And the internet in particular has now become main stream and is an integral part of our lives. We all use Google maps to get directions and locate streets. We use social media platforms, such as Instagram and Facebook to connect with our friends, whether through sharing photos of special moments or whether through engaging with each others’ posts. And virtually all of us read the daily news through online blogs and websites. Internet nowadays is awash with all kinds of blogs, and have thus become one of the hallmarks of online marketing. Since we all love blogs and being informed, and since we’re sure that you love to too, we have done our research and found the Top 25 Tech Blogs of 2016. We believe that this very worth reading because these people have found ways to stand out of the crowd. If you want to become successful in every aspect of your life and grow as a tech blogger, these are the people you need to follow. They have made a huge difference because of their unique approach and their positive mindset when dealing with the various difficulties that every blogger faces. They’ve positively influenced many bloggers and small businesses and inspired new entrepreneurs to take their first steps. They have become authorities and they have become the kind of leaders and role models that people follow and admire. Her writing has been featured in Forbes, Social Media Examiner, Problogger, Mashable, The Huffington Post, and Business Insider. On her blog, you’ll find interviews with other influential bloggers, tips and tricks, how-to guides, and long form articles on everything from productivity to branding. Shel is a green and social change business consultant showing business how to profit while solving hunger, poverty, war, and catastrophic climate change. Also an international speaker and bestselling author of Guerrilla Marketing Goes Green. Ann Handley is a veteran of creating and managing digital content. She’s the author of the WSJ bestseller Everybody Writes: Your Go-To Guide to Creating Ridiculously Good Content and co-author of Content Rules: How to Create Killer Blogs, Podcasts, Videos, Ebooks, Webinars (and More) That Engage Customers and Ignite Your Business. Her writing has also appeared in Entrepreneur magazine, Mashable, The Huffington Post, and American Express OPEN Forum. Apart from the writing and blogging, she is also the Chief Content Officer of Marketing Profs, a Linkedln Influencer, and a keynote speaker. Dan Zarrella is an award-winning social media scientist and author of four books: The Science of Marketing, Zarrella’s Hierarchy of Contagiousness, The Social Media Marketing Bookand The Facebook Marketing Book. He has a background in web development and combines his programming capabilities with a passion for social marketing to study social media behavior from a data-backed position and teach marketers scientifically grounded best practices. His work has been featured in The New York Times, Wired, Fast Company, Forbes, The Huffington Post, The Atlantic, Mashable, and TechCrunch among others. On his blog, he usually released a lot of data-backed infographics that can help bloggers and marketers gain better insight into what works and what doesn’t. Jeremiah Owyang is a social media industry analyst, speaker, and a leading voice at the intersection of technology and business. He’s been actively blogging since 2006 and frequently shares insights from his research and what they mean for the future of business. Some of the subjects that he covers on his blogs include customer experience customer experience, social business, interactive marketing, and now the collaborative economy. Apart from the blog, he and his team also publish detailed reports on topics like how products, services, and markets have changed with the collaborative economy; how businesses manage complex, scaled social media programs; and the career path of the new social strategist. Rebekah is a social media strategist, speaker and digital marketing specialist, the Chief Experience Officer of Imagine WOW, a digital marketing agency, and the author of How to Use Social Media to Virtually Crush the Competition. She’s worked with Fortune 500 organizations as well as entrepreneurs, helping each one build winning teams, brands, and businesses. For two years in a row, she’s been voted among the “Top 100 Social Media and Technology Leader” by Inman News. Her award-winning blog, RebekahRadice.com, is committed to helping small business owners and entrepreneurs make radical shifts within social media and online market. Tamar Weinberg focuses on customer experience, productivity, inbound sales, digital marketing, and writing. As the author of the bestselling O’Reilly book The New Community Rules: Marketing on the Social Web, Tamar has been an early adopter of all things social and tech. She has spoken at dozens of conferences and has been recognized in a number of global publications, both print, and digital. On her blog Techipedia, Tamar covers social media marketing, customer happiness, content marketing, productivity, and a whole slew of other topics of relevance to today’s digital era. Neville, is an Entrepreneurial Business Communicator. With over 25 years’ experience in public relations, marketing communication, employee, compensation and benefits communication, and investor relations, Neville also brings over a decade’s practical experience with digital and social media for business with an extensive presence and influence across the social web. He is a frequent keynote speaker and presenter at public business conferences and other events in the UK, continental Europe and the USA. The way we work has changed a lot over the past 25 years, and Neville Hobson has kept pace. He now blogs about technology, digital communication and social media, to help organizations stay up-to-date on the latest trends, behaviors and best practices. Ted is a leading Social Marketing Strategist, Keynote Speaker, Brand Evangelist and Acting CMO of Brand Innovators and in March 2009 started publicly using and evangelizing the term ROR: Return on Relationship™… a concept he believes is the cornerstone for building an engaged multi-million member database, many of whom are vocal advocates for the brand, like the one he built, as CMO, for e.l.f. Cosmetics… EyesLipsFace. Publicity expert Joan Stewart, aka The Publicity Hound, has worked with thousands of small business owners, nonprofit executives, authors, speakers, experts, corporate PR pros, publicists and marketers who need online visibility and print and broadcast publicity. A digital analyst, anthropologist, and futurist, Solis has studied and influenced the effects of emerging technology on business and society. His research and books help executives, and also everyday people, better understand the relationship between the evolution of technology and its impact on people and also the role we each play in evolution. He is a regular contributor to leading business and industry publications including Adage, Forbes, Wired, VentureBeat, , among others. Brian is also an official LinkedIn Influencer with over 500,000 people on Linkedin, Twitter and Facebook. In early 2007, he wrote the worldwide hit The Social Media Manifesto, which showed in detail how organizations need to rethink business, marketing and service strategies. Steve is the founder and director of the Learning Revolution Project, the host of the Future of Education interview series, and founder and chair or co-chair of a number of annual worldwide virtual events, including the School Leadership Summit and the Global Education Conference, Library 2.0, the Future of Museums, Gaming in Education, and the Homeschool Conference. He has pioneered the use of live, virtual (and peer-to-peer) education conferences, popularized the idea of education “unconferences,” built one of the first modern social networks (Classroom 2.0) for teachers in 2007, and developed the “conditions of learning” exercise for local change. He supported and encouraged the development of thousands of other education networks, particularly for professional development. For the last ten years, He runs a large annual ed-tech unconference, now called Hack Education (previously EduBloggerCon). He has been a Freelance Technology Writer since 1988, starting off as a technical writer and moving into technology journalism in 1998. His current positions include: Enterprise reporter at TechCrunch. Contributing Editor at EContent Magazine where he writes the Media Redux column. In addition, he has helped develop the SocMediaNews (originally called SocMedia101) blog in 2009 — and still contribute to it on a regular basis. He won an Apex Award for Publications Excellence in Feature Writing for the following years 2005, 2006, 2007, 2008, 2010. His blog was named one of the 200 most influential technology blogs by Datamation for 2008 and 2009. His site, The Ed Tech Roundup was formed in early 2013 with the goal of helping educators with technology integration . Tech Roundup was recently selected as one of the Top 50 K-12 I.T. Blogs by Ed Tech Magazine and as a Top 50 Blog by Getting Smart. He is an award-winning biology and technology teacher from Kansas who spent time teaching in South Korea and Colombia as well. Currently he is an associate instructor at Indiana University while earning his Ph.D. in Instructional Systems Technology. Amanda is a results-driven SEO content writer and marketer, copy writer, blogger and social media specialist who helps businesses (B2B and B2C) create high-quality, researched, content and copy for their audience. Her formal education includes a Master of Science, Management degree, two accounting degrees, and a graphic design certification. She was awarded an Outstanding Service Award on December 14, 2014 at the Parma Animal Shelter luncheon for being the shelter’s Social Media Administrator/Coordinator and on call cat Adoption Counselor. She is also the shelter’s Email Marketing Specialist. Jeff and Michael are the founders of the UrbanBound web-based platform that allows businesses to offer a managed lump sum benefit to their transferees. With UrbanBound’s online tools, employees can educate themselves, organize their move, and get connected to vendors who offer preferred pricing. The company’s breakthrough approach has already enhanced lump sum benefits for hundreds of forward-thinking companies. In June 2015 the company was named one of the 101 Best and Brightest Companies to work for. It has also won many other awards during the past years and also her company in 2016 raised $8.5M to better help businesses relocate employees. Avery Swartz is a Toronto-based award-winning web designer, consultant, speaker, and tech skills instructor. 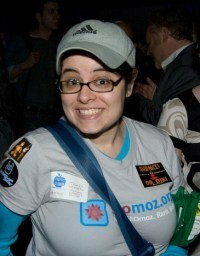 A self-described design geek, she helps demystify the web for small business owners, charities, and arts organizations. Avery offers a friendly and casual approach with all her projects. In addition to her web design work, Avery is the founder and CEO of Camp Tech—a learning hub that provides practical tech training in a fun and friendly environment. Avery provides on-site instruction for corporations and has facilitated interactive technology workshops for over 1000 students. Beth Kanter is the author of Beth’s Blog: How Nonprofits Can Use Social Media, one of the longest running and most popular blogs for nonprofits. Beth has over 30 years working in the nonprofit sector in technology, training, capacity building, evaluation, fundraising, and marketing. Beth is an internationally recognized trainer who has developed and implemented effective sector capacity building programs that help organizations integrate social media, network building, and relationship marketing best practices. She is an expert in facilitating online and offline peer learning, curriculum development based on traditional adult learning theory, and other instructional approaches. Also, she has trained thousands of nonprofits around the world. Beth was named by Fast Company Magazine as one of the most influential women in technology and one of Business Week’s “Voices of Innovation for Social Media.” She is Visiting Scholar for Social Media and Nonprofits for the David and Lucile Packard Foundation in 2009-2013. Brian is the CEO of Honigman Media, a content marketing consultancy based in Philadelphia. Through speaking, teaching, corporate training and workshops, coaching, strategy development and content creation, he customizes his expertise in content marketing and social media to meet the needs and expectations of his clients. To date, he’s spoken at and worked with the United Nations, the Weather Company, UNICEF, Thomson Reuters, NATO, Adknowledge, Amerisleep, Sumall, People Magazine, the American Advertising Federation, Entertainment Weekly, Samsung, Sprout Social, Internet Week, Percolate, Wix, Quaero, Gypsy Warrior and others. He’s a frequent contributing writer to the Wall Street Journal, the Next Web, Forbes, Entrepreneur Magazine and other publications. To date, his writing on marketing has been shared over 200,000+ across social media. He’s been named a “seasoned digital marketing expert” in Forbes and an “SEO expert to follow” by Search Engine Watch. Cendrine Marrouat is a social media coach / blogger / curator, and the founder of Social Media Slant, a blog focusing on social media tips, tools, stats, and news for small businesses and solo-preneurs. She is a Social Media Blogger & Trainer – Content Curator – Author – Photographer – French Instructor – Translator. For Cendrine, social media is about the human journey. Her decision to work in social media stemmed from that idea. She has dedicated the last six years to helping small business owners and entrepreneurs to leverage the power of online relationships and become strong and trusted brands. Joel is a franchise ownership advisor. He offers real-world tips and advice (that you can take to the bank) on exactly how to find, choose, research, and buy a franchise. A profitable franchise. He is the author of, “Become a Franchise Owner! The Start-Up Guide to Lowering Risk, Making Money, And Owning What You Do.” In 2001, he started to get interested in the internet. It was still relatively young, but it was getting harder and harder to ignore. While he was busy learning how to write blog posts—how to write, period, he was getting to be pretty well-known locally. (As The franchise guy) He was getting a ton of referrals, and his local franchise consulting business was doing pretty well. Writing for Small Business Trends brought him some much-needed exposure, and soon he was getting approached by other web publishers who wanted him to write about franchising for them, too. One of them turned out to be a website owned and operated by the United States Government. He has been writing a monthly article on franchising for them-The U.S. Small Business Administration, for almost 6 years now. Josh Steimle is speaker, writer, and entrepreneur. He has written over 200 articles for publications like Forbes, Mashable, TechCrunch, Entrepreneur, and Time, and is the author of Chief Marketing Officers at Work. He is the CEO of MWI, a digital marketing firm he founded in 1999 with offices in Hong Kong, Singapore, China, and the U.S. Steimle regularly presents to business groups, industry associations, and at events like ClickZ Live, Echelon, Ad:Tech, CommunicAsia, Social Media Week, and the Content Marketing Conference. Entrepreneur magazine recognized Steimle as one of 50 Online Marketing Influencers To Watch in 2016, and data from social media research firm Leadtail recently ranked Steimle #11 on their list of People Most Mentioned and Retweeted by CMOs. Steimle has been interviewed for national TV and radio on topics related to technology, and in Asia Steimle consults with leaders in government on topics related to entrepreneurship and startups. Do you want to improve your business results? Whether you are an executive, team leader, or an entrepreneur, you can learn the secret to building deeper trust and connection with your team. Karin’s dynamic approach will help you develop a game-changing strategy and create a plan for execution. As a keynote speaker, leadership consultant, and MBA professor, Karin helps leaders improve business results by building deeper trust and connection with their teams. As a former Verizon Wireless executive, she has over twenty years of experience in sales, marketing, customer service, and human resources. Karin was named on the American Management Association 2015 List of 50 Leaders to Watch, Inc’s list of 100 Great Leadership Speakers For Your Next Conference, and Trust Across America’s 100 Thought Leaders in Trusted Business Behavior. Her award-winning blog, Let’s Grow Leaders, has grown into a highly interactive, international community. She’s the author of two books, Overcoming An Imperfect Boss and Winning Well: A Manager’s Guide to Getting Results Without Losing Your Soul. Maggie Patterson is a copywriter and communications strategist. She works hands on with entrepreneurs to help them market their businesses, using content and communications strategies along with copy that converts, to meet business goals. With more than 15 years of experience she has worked with companies of all sizes from big brands to solopreneurs. After cutting her teeth during the dot-com bubble and bust in Canada’s leading PR agency, Maggie started her own highly successful marketing and communications consultancy. She is the host of the Marketing Moxie podcast and her work has been published on leading websites, including Entrepreneur.com, The Huffington Post, Virgin.com, LKR Social Media, Duct Tape Marketing, Content Marketing Institute, Yahoo Small Business and more. The 18 year old inspires others as a motivational speaker, blogger and intrapreneur (instilling the entrepreneurial mindset into business organizations). Teenager Entrepreneur is a movement that educates and empowers teenagers worldwide to take their passions and convert them into products. By making a profitable income and propelling their future, teenagers will foster self-confidence by discovering their life’s purpose. Michael and his brother Marc Guberti believe in elevating and uplifting others. The two founders work to raise the level of their students’ lives, raising others’ standards towards a more peaceful and prosperous life. These guiding beliefs manifest themselves through the Teenager Entrepreneur Boot Camp, Coaching, Speaking and other services. Now that you’ve been made aware about the Top 25 Technology Blogs of 2016, I would highly recommend you follow them and use them as role models for your career as an entrepreneur. This will ensure you stay on the right path by overcoming any difficulties that you will inevitably face, and also help you achieve your goals both in your career and personal life.